Kids love handprint crafts. 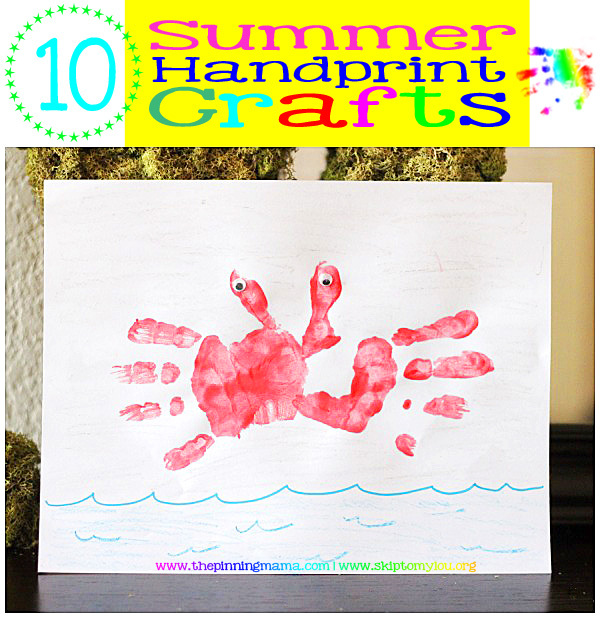 Amaze them as you show them how to turn their handprints into flamingos, crabs and even a handprint ice cream cone. 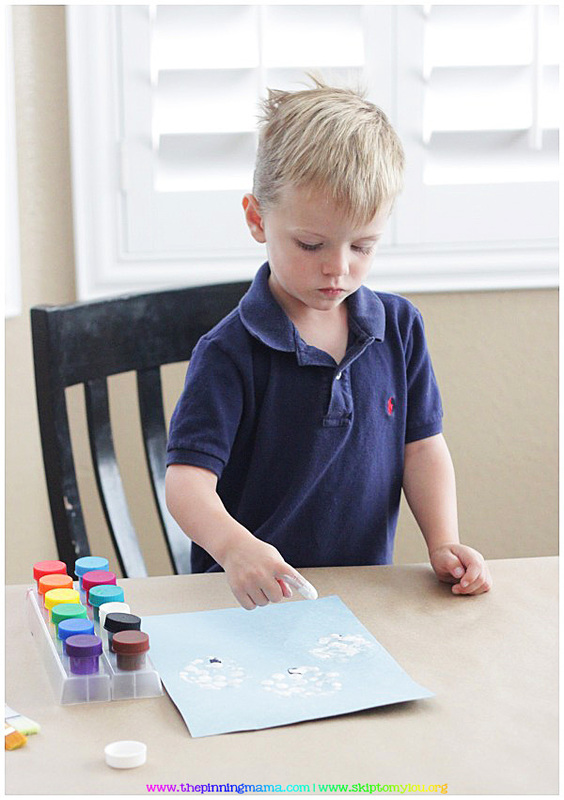 This fun kids craft is sure to encourage creativity. 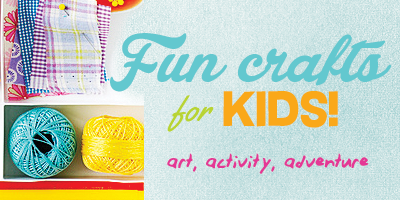 Be sure to check out all our summer crafts and activities ideas to keep kids active and entertained this summer! 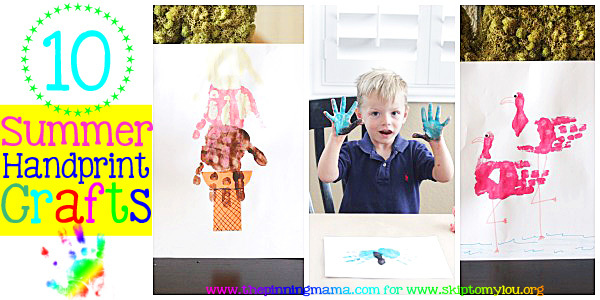 The best craft bloggers will share fun kids crafts all summer long on Skip to my Lou! From homemade stickers to homemade gummies you will find creative ideas! I don’t know about you, but where I live summer is in full swing and it is HOT! I mean triple digits kind of hot. Needless to say, with two preschoolers to keep entertained all day- every day, we have been creative in coming up with all sorts of projects we can do indoors to keep little hands out of trouble. 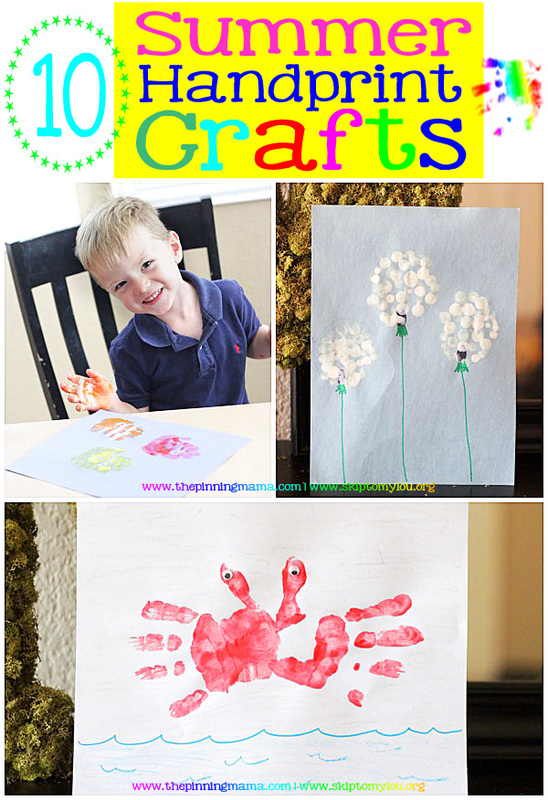 Some of our favorite things to do are handprint crafts! I am excited to share with you not just one or two, but TEN fun art pieces you can make with your kiddos to celebrate summer! I am going to show you five right here on Skip to my Lou and I have the other five ready and waiting for you at my normal home, The Pinning Mama. 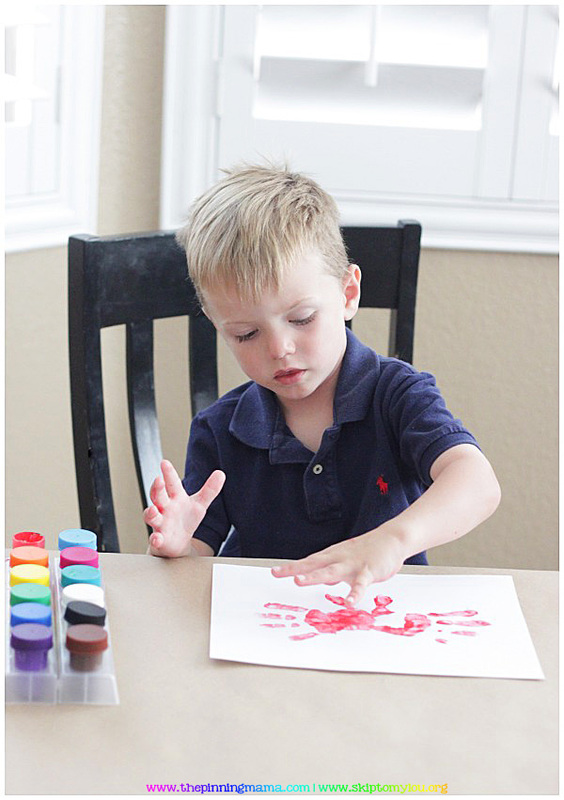 Kids Washable Poster Paint- This is the paint we use! Paint brush – Anything you can spread paint all over those hands is fine! Anxious little hands- Sorry, you can’t get these on Amazon, you will have to supply your own! 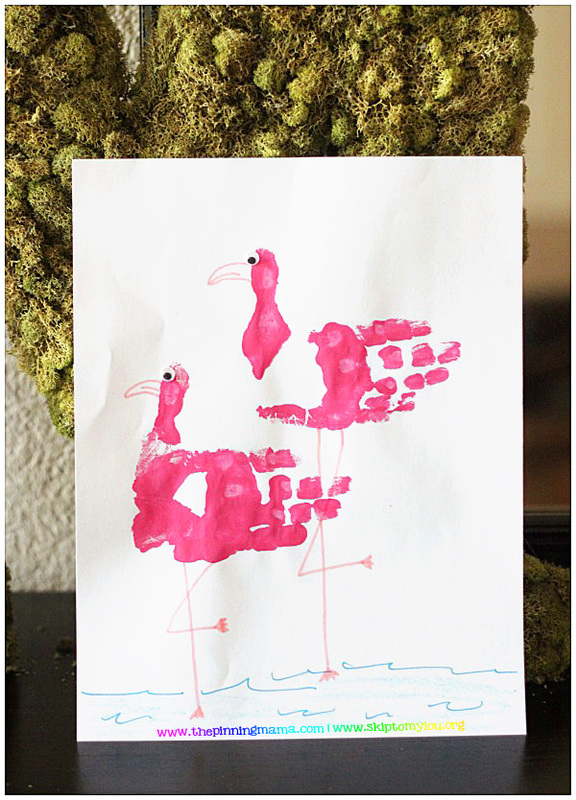 Flamingos seem like they would be hard, but they are actually surprisingly easy to make! Just paint the hand pink, then have your kiddo keep all of their fingers together except the thumb which will point straight out. Press their hand down on the paper and release. I find that it is easier and more natural to have the thumb pointing down when you press their hand to the paper then when you are done with the handprint, you can turn the paper 180˚ and the hand print will be positioned as you want it to be. Much easier than trying to contort your preschooler into the right position haha! Once the handprint(s) are dry, add a beak, legs, and some water. Then glue on a googly eye, or just make a dot with the marker. What could remind you more of summer than a cute little crab! To make this guy, just paint your kid’s hands both red. Have them spread their fingers and place one hand at a time on the paper, making sure to press all the way down and overlapping the backs of the palm. Again, it might be easier for them to have their thumbs pointing down, then flip the paper like we did in the picture below! Once the handprint is dry, draw in some sand and water and glue (or draw) on two eyes. I also had some small sea shells my son collected from the beach to glue on and I totally forgot! If you do take a trip to the beach this summer make sure to grab some shells because this will be the perfect memory to create with them! My whole family LOVES ice cream. So when we make a picture of one, of course it will have 3 big scoops! 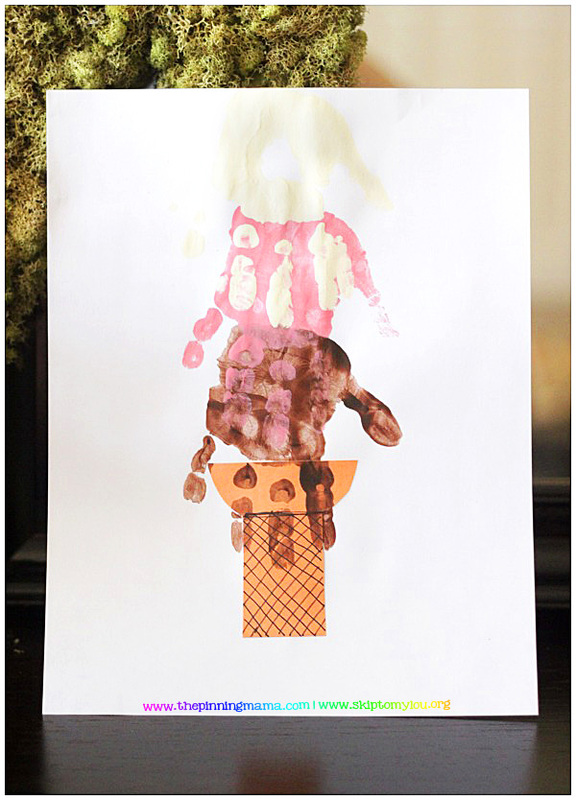 To make your ice cream cone, first cut out a cone from construction paper, or draw one with a crayon or marker straight onto the paper you will be using for the handprints. If this is out of your comfort zone, just print off a pic from online then cut and paste it. Next paint your kid’s hand brown and press it to the paper with the fingers pointing down the cone and the palm pointing up, as if the ice cream scoop is melting down the cone. Wash the hands off completely and then repeat with pink and cream colored paint. Some of my best memories from summer are of laying out on warm summer nights and looking up at the expanse of bright stars above. It would be a great activity to make this handprint star and then look at the stars once it gets dark and talk about them and find constellations. 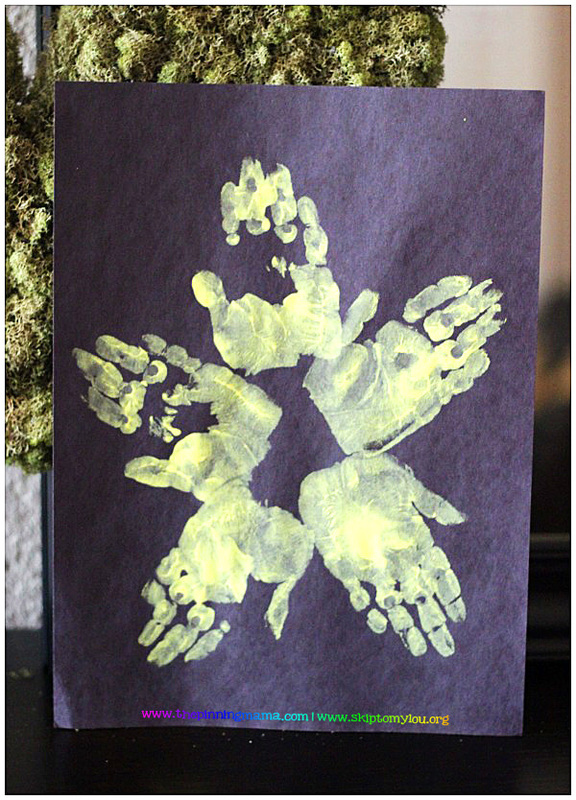 This is super easy to make just take a piece of black construction paper and paint your kid’s hand yellow. Have them place all their fingers tightly together and then press it to the top of the paper pointing straight up. Refresh the paint on the hand and repeat four more times making each leg of the star. Okay, okay, this isn’t a handprint craft… it is technically a fingerprint craft. It is so stinkin’ cute and summery though, I just had to include it! 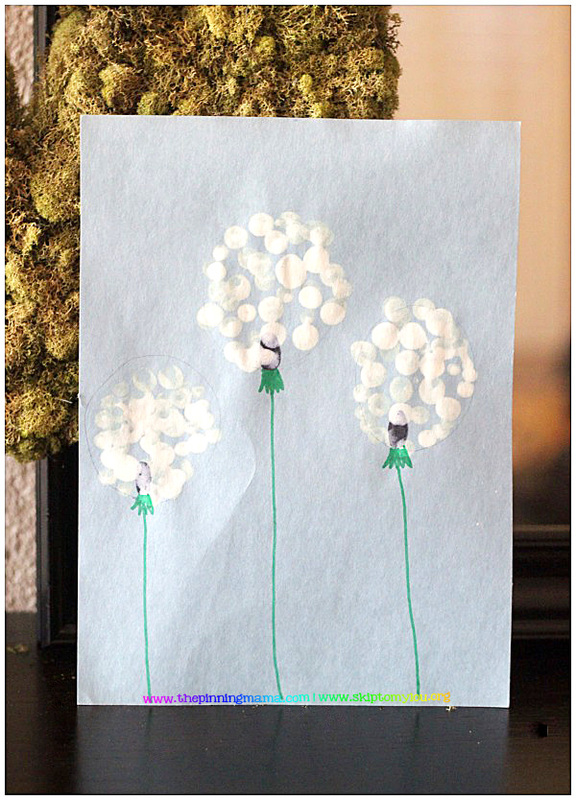 Since you will be using white paint, you will need to pick a colored sheet of paper for this craft. We used light blue to look like the sky on a clear summer’s day. Draw a black oblong oval for each dandelion you will add to the page. Then since my kids are young, I very lightly drew the outline of a circle where each dandelion would go so the kids could just fill in the shape with their fingerprints. If your kids are older you might can skip this step. Have your kiddo dip their pointer finger in the white paint and dot their fingerprint all inside the circle until it is relatively full then move on to the next dandelion until they are all full of white fingerprints. Let the picture dry, then use a green marker to add a stem onto each dandelion. Pretty easy huh? Also, full of fun and creativity for the little ones. I have 5 more GREAT summer handprint crafts waiting for you over at The Pinning Mama, so make sure and stop by for more fun ideas! We also have lots of summer ideas including our free printable Summer Bucket List, End of School Year Interview and more! At The Pinning Mama, we believe it doesn’t have to be hard to be great! We love family friendly recipes, DIY’s, crafts, and kid’s activities! We hope you will join us for the good stuff in life! Along with the web, you can find us on Facebook, Pinterest, Instagram, and Google+!